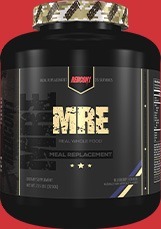 Fuel your body with MRE, commonly known in the Military as Meals Ready-to-Eat. M.R.E. are rations given to the soldiers to provide them with nutrients to keep running strong while out in the field. The most important fuel you can give your body is real food, especially whole foods. MRE is made from quality ingredients and a real protein blend. Our formula contains absolutely no whey! With MRE, we have given you the nutrients you need to repair and recover muscle tissue from the best possible whole foods sources. * Stop reaching for fast foods and reach for whole foods with M.R.E. Rolled Oats, Protein Blend [Beef Protein Isolate (bovine), Salmon Protein (fish), Chicken Protein, Egg Albumin (egg), Brown Rice Protein, and Pea Protein], Dehydrated Yam, Dehydrated Sweet Potato, Pea Starch, Coconut Water Powder (coconut), Dehydrated Blueberry Fruit, Dehydrated Goji Fruit, Maltodextrin, Dextrose, MCT Oil, Natural Flavor, Cellulose Gum, Cinnamon, Salt, Sucralose, Acesulfame-Potassium. Allergen Warning: Manufactured on shared equipment which processes products containing milk, egg, soybeans, wheat, shellfish, fish, tree nuts flavor, and peanuts flavor. Directions For MRE: Take (1) serving mixed with 14-16 ounces of water or favorite beverage at least once per day. For maximum results, take (1) serving immediately post workout and (1) serving anytime throughout the day to add an additional meal. Warnings: KEEP OUT OF THE REACH OF CHILDREN. This product is intended to be consumed by healthy adults 18 years of age or older.Before using this product, seek advice from your pharmacist or physician. Avoid using this product if you have if you have any pre-existing medical condition including but not limited to: high or low blood pressure, cardiac arrhythmia, stroke, heart, liver or kidney disease, seizure disorder, thyroid disease, psychiatric disease, diabetes, difficulty urinating due to prostate enlargement or if you are taking MAO Inhibitor or any other medication or supplements. Do not use if you are pregnant or nursing, prone to dehydration or exposed to excessive heat. Discontinue use and consult your healthcare professional.